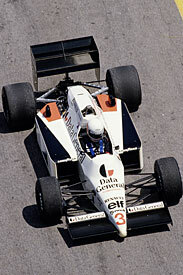 We've been getting all nostalgic this weekend, reminiscing about the classic Formula 1 season that was 1986. In this week's magazine, a host of leading lights look back 25 years. Martin Brundle tells what it was like to drive those monster turbocars, Williams team chief Patrick Head looks back on his squad's Mansell/Piquet civil war, Jacques Laffite describes the British Grand Prix crash that ended his career, Brabham insiders talk of Elio de Angelis's tragic accident, Stefan Johansson grimaces about the Ferrari F186, McLaren designer John Barnard remembers Keke Rosberg’s final F1 season, Johnny Dumfries tells what it was like to partner Senna at Lotus, and the glittering potential of Carl Haas’s FORCE team is dissected. 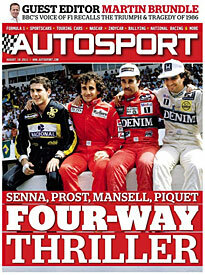 So get your hair cut into a Bono-style mullet and wallow with the AUTOSPORT team in a vintage year. Kubica Update - Moving up to date, our Italian correspondent Roberto Chinchero reports from Italy on how his friend Rubert Kubica is getting on with his recovery from his terrible injuries. Hopes are high that the Pole can be in an F1 simulator within the next few weeks, but first he needs one more operation to be a success. Masters review - In Holland, the F1 hopefuls were in action in Europe's blue-riband Formula 3 race: the Masters at Zandvoort. It provided a breakthrough win for Sweden’s Felix Rosenqvist, and heartbreak for Spaniards Roberto Merhi and Daniel Juncadella, as Peter Mills describes. To read this week's AUTOSPORT magazine, click here.